NOT easy to believe, but there was a wish--wild indeed—that the Pacquiao-Mayweather dream bout would be signed during the Pope’s visit to the Philippines. In fact, there were silent prayers from male fish vendors in the Mandaluyong City wet market to that effect. “Tuloy na, (It’s on}” screamed a toothless trash scavenger from the roadside immediately after New Panaderos, main market street. The poor fellow explained he expected the dream fight to be one of Pope Francis’ blessings to Filipinos. Manny Pacquiao himself feebly fueled optimism with his call on Floyd Mayweather Jr. to sign the contract within the month, otherwise they choose from other worthy opponents, like Amir Khan. This one is not very funny, but while they were scanning everywhere for positive signs, there came a credible tip which said Mayweather is not in any way afraid of Pacquiao. Yes, not afraid of Pacquiao, confided international matchmaker Lope Sarreal Jr., brother-in- law of ring immortal Flash Elorde, who said he was recently visited by a foreigner friend, a martial arts instructor supposedly associated with Mayweather. Sarreal’s trusted friend claimed having talked to Mayweather in Las Vegas, where the unbeaten American world champion was working out in his gym. Sarreal has lent what his visiting friend, on his way to an appointment in either Malaysia or Thailand, had to explain regarding Pacquiao’s fearsome might. That was what Sarreal’s friend, whose name we keep for the moment, had allegedly been told by Mayweather himself. That’s self-explanatory, Sarreal explained, Mayweather knows he’s the superior boxer, but he may not be able to stand-up to Pacquiao’s relentlesss explosiveness. 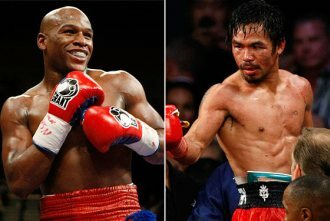 Sarreal himself claims Pacquiao would be an underdog in case the dream fight pushes through, because the phenomenally skilled Mayweather is also capable of adjusting as many as three times inside a round. He can’t adjust to a killer shot? He can, Sarreal said, but Mayweather, who tends to paw his punches, does not own that patented right counter shot which Juan Manuel Marquez threw in stopping Pacquiao cold in December 2012. But Mayweather remains the superior boxer. Of couse, Sarreal counters, but with no surefire killer punch of his own, he stands the danger of being run over by the bullstrong, onrushing Pacquiao in a firefight. A little confusing: Does saying he’s not afraid of Pacquiao per se makes Mayweather less of a coward? No comment, Sarreal begged, just trying to say it would be next to impossible for us to see Pacquiao and Mayweather squaring off inside the ring. Even if they make Pacquiao wear a bigger, thicker left-hand glove? Maybe they should offer to have Pacquiao’s left hand tied to his back, Sarreal concluded with a naughty smile.